This is another movie that puts mood and craft over substance and story. It's a coming of age story, and honestly I don't think these kinds of stories are for me. I understood that Boyhood was a masterpiece of film making, and I agree that the project that lasted over a decade to follow the progress of the boy into early adulthood was very well done, but I still think the actual story was a bit of a snoozer. This movie is slower. And it's less interesting. And it didn't take as long to film, so it must have less art in it. Liam Walpole is the titular Goob, and like Boyhood the story is more about other people than it really is about him. Nevertheless, he's the one we follow, and we see things from his perspective. 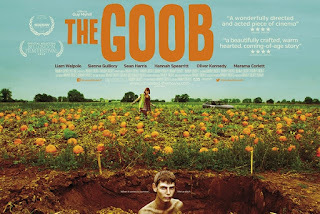 Goob doesn't talk much, and his random encounters with young ladies are jerky and don't really make a whole heap of sense based on his introverted personality. Sienna Guillory plays Goob's mother, and just like in Boyhood, she has terrible taste in men and she just can't seem to get her stuff together. Further complicating matters is the fact that she, like pretty much everyone in this movie, is a bit oversexed and really, really doesn't think much about other people or (more importantly) the welfare of her son. Sean Harris plays Goob's mother's boyfriend. He's introduced, and we all immediately know that he's a big dumb jerk. The real question is about his swagger and his power - where do either of them come from? He doesn't demonstrate the ability to do much more than intimidate at any point, but I guess we have to assume this abusive, threatening tyrant of a man has done something in the past to make everyone afraid of him. It would have been nice to get a bit of that back story. Speaking of story - there isn't one. We have a lot of sub-plots, and they conspire to both fake an actual story and provide enough entertainment that you don't either switch to another movie or fall asleep. Well, I didn't do either of those things, so I guess it worked. But it only barely worked. I was halfway into the movie and I figured I was too far in to give up, but I was plenty bored. Goob. Presumably he's watching another movie on someone's TV. Basically, there is Goob's first hookup and then there is his second hookup (the second might be something more, but it doesn't really seem like it, and they don't go into any kind of emotional relationship at all). You have the angry boyfriend's race car (and Goob and his buddy messing with it). You have the kid who is brought in for essentially day labor who winds up befriending Goob and then unceremoniously leaving. And... that's about it. There isn't enough story for a whole movie in here. Bottom Line: The movie is good with mood, but that's about it. If you want a good moody movie, watch The Guard.